These placards are numbered 1-50 and made of unbreakable polyethylene rather than the brittle styrene markers. 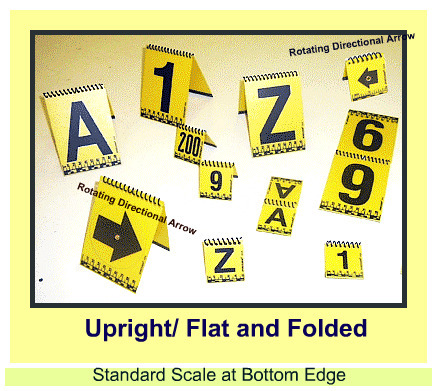 They are useful for photographic orientation and spatial relationships of evidence located vertically or horizontally. The placards are hinged for angle adjustment placement OR upright against an object OR fully open flat to the ground. This capability affords compact storage when not in use. The graphics are designed for optimum visibility at greater distances. The largest size is visible to 100 feet. All placards include a standard base rule on the bottom edge on each side for dimensional reference and readable linear rectangles.